The valuable combination of blending polyester and cotton makes the 5049 Series ESD Lab Coat more comfortable to wear than polyester ESD smocks. 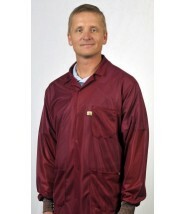 Superior workmanship provides reliable panel to panel continuity of the garment. 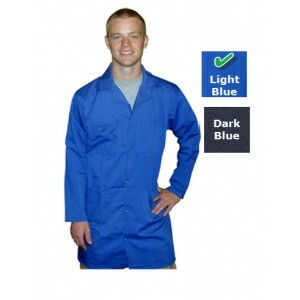 Available in Light Blue and Dark Blue Meets or exceeds requirements of ANSI ESD-S20.20. Transforming Technologies offers custom logos and name identification on all of our jackets. We can print your logo, your name, just about anything on any of the jackets we sell for one low price. The markings are soft and breathable. 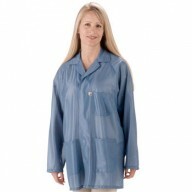 The markings are very durable and designed to withstand washing for the life of the jacket.